Methylation is involved in nearly every aspect of life. 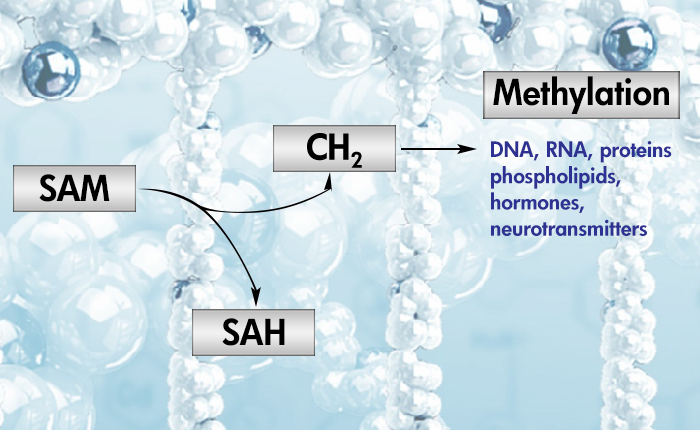 SAM is the sole methyl donor for a variety of methyl-transfer reactions in DNA, RNA, proteins, lipids, phosphilipids, hormones and neurotransmitters. Proper DNA methylation is essential for normal embryonic development. However, when the methyl-transferase gene is homozygously deleted, it is lethal. DNA improperly methylated has been found in many tumours. Alterations in DNA methylation patterns induce the expression of oncogenes or silence the expression of tumour-suppressor genes. Since SAM is an intrinsically unstable molecule, without a distinguished maximum absorption peak, traditionally the determination of its concentration in various biological fluids and tissues has been a challenging task. The new antibodies, available from AMSBIO, offer a simple, convenient immunoassay method that does not require costly instrumentation for the determination of the biological concentration of SAM, and to monitor its change and metabolic paths in the body fluids, tissues and organelles. AMSBIO also offers other immunoassay products to determine the ratio of SAM and SAH, also known as the Methylation Index, which is widely recognized as a valuable way to evaluate the methylation status of humans and other organisms.